How Is Your Search Engine Handling Synonyms? I started by Googling ‘funny pets’, and Google came up with a number of highly relevant results. I went ahead and then searched for ‘hilarious pets’ and Google came up with a different set of results. On a side note, you should check out the top results on ‘funny pets’, myfunnypets.net and petTube.com; they have some really funny pet videos that actually kept me engaged from writing this article. What we identified is this. 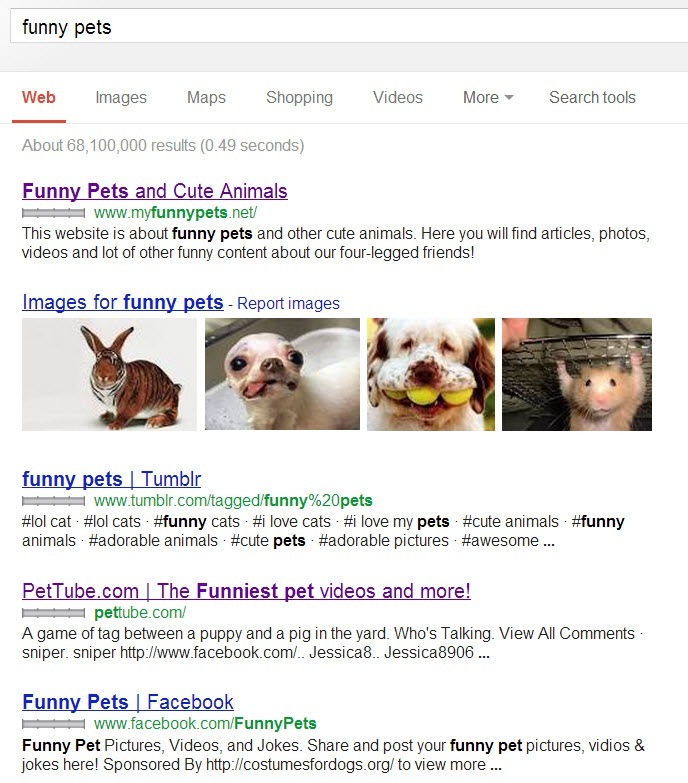 Query, ‘Funny pets’ has returned different results from ‘hilarious pets’. 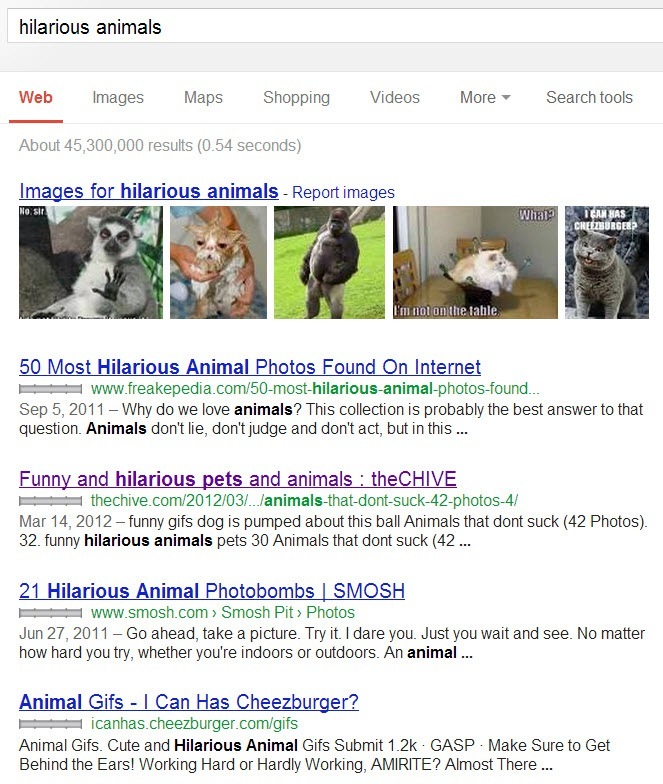 We also did all kinds of searches—‘humorous pets’, ‘funny animals’, ‘hilarious animals’, ‘ludicrous pets’, ‘silly pets’, etc. Most of the results that Google was able to return contained the specified search term rather than its synonym. Alternately, we can say Google did not handle the synonym scenario well. Let me tell you a little about this search term ‘funny pets’. It is a very low competition search term, getting about 12,000 searches globally every month. The synonymous words get even fewer searches. 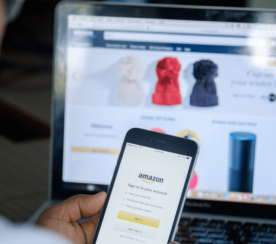 Since the search query has low competition and low possibility for marketing, most of the top results do not point to advertisement-type content. In essence, the top results that Google returned were highly relevant to the query. What we know about a low-competition search query is that it is not being actively pursued by SEOs. Companies find it difficult to market their products by optimizing for those terms. People find it simply unnecessary to optimize for them. As a result, anybody that publishes a website based on that search term can get on top of Google results with the least amount of work. Also, since the search term doesn’t yield a lot of business growth, the person publishing a website based on that is probably not actively looking to make money. They are doing it out of interest and passion. Hence, what we get is a highly relevant result on top of the SERPs. 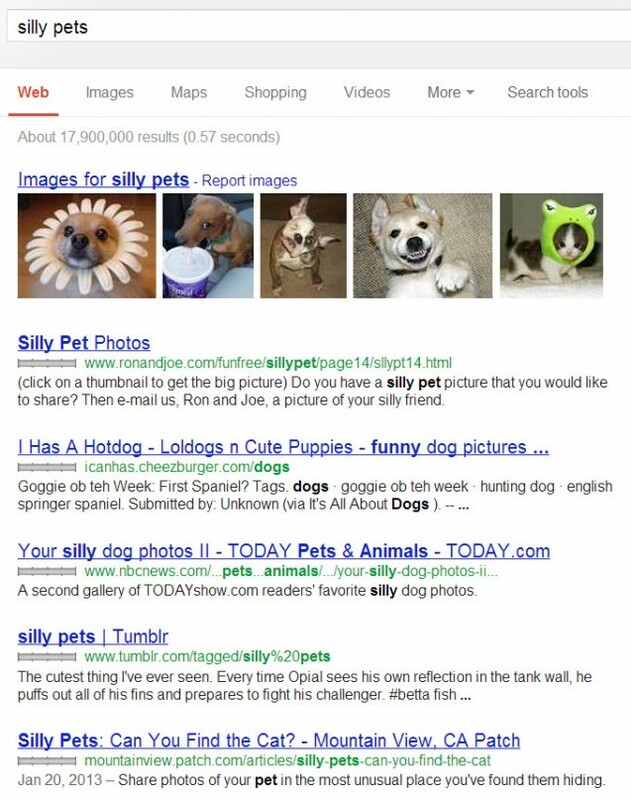 Since there are multiple web pages that contain the term ‘funny pets’ on their pages, Google returns those results first. When we looked for ‘hilarious pets’, however, we could find one or two results that had the word ‘funny’ in them, and it was highlighted by Google. This is so with most of the synonym search results. Let’s look at another example now. I searched for “achievements by kids” (without quotes of course). 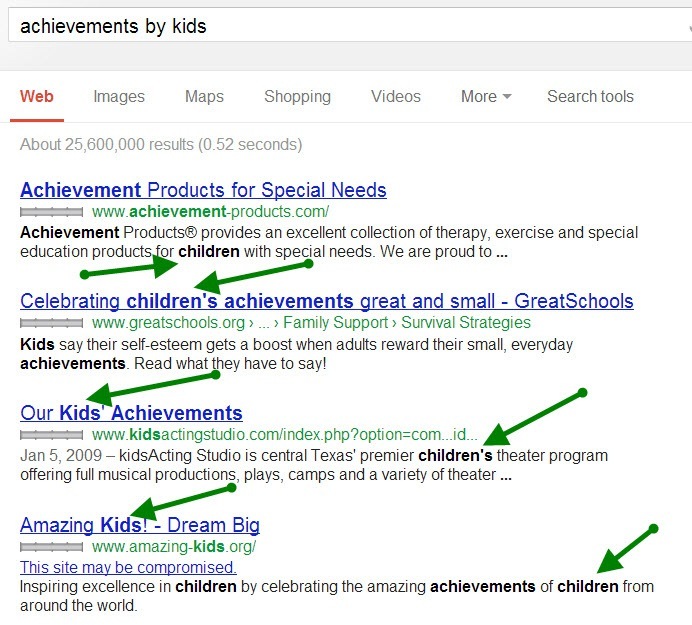 As you can see, Google has highlighted not only ‘kids’ but also ‘children’ in the search results. But in the entire page, there is no synonym for ‘achievement’. In the same way, I searched for ‘children’s accomplishments’ and Google returned results containing ‘kids’ and highlighted that term (kids), but did not come up with any results containing ‘achievements’ or highlight that term even if it appeared in results. This result points to one assumption. Google probably identifies one of the words in the search queries as the keyword, and finds most feasible synonyms for that. It probably ignores synonyms of other words in the search query and tries to come up with results containing those exact words. I went into Google Keywords tool and found a few highly competitive search queries. One of them is ‘cheap auto insurance’. It was highly informative how Google returned the results this time. On most of the top results, Google highlighted the term ‘car’. It means the search engine identifies ‘car’ as a synonym for ‘auto’. There was also another term ‘low cost’ in the results. I then searched for ‘low-cost motor insuring packages’. Yes, mixed it up! And yet, you know what? 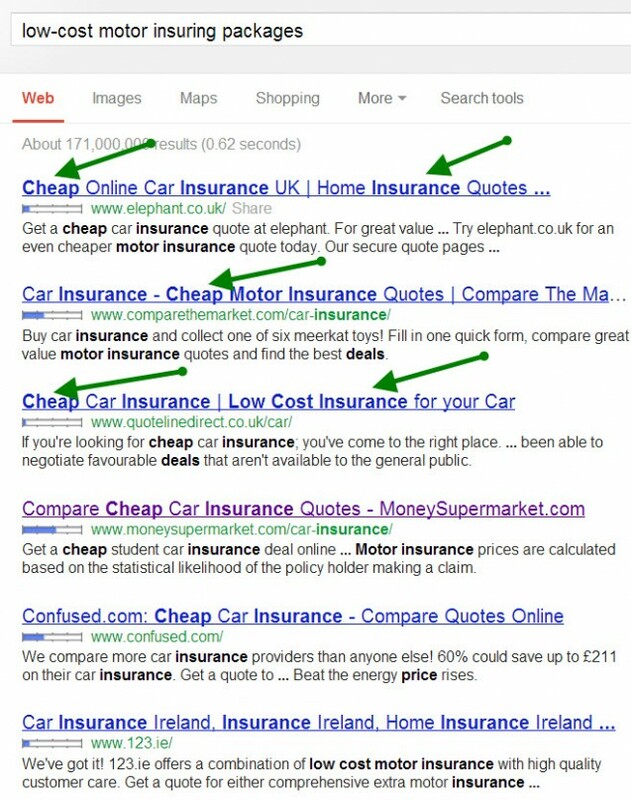 Google came up with all kinds of results containing ‘car’, ‘cheap’, ‘auto’, ‘insurance’, etc. One thing you should note about competitive keywords is this. They are highly targeted. SEO companies really want to capitalize on these terms and get their clients on top for these search queries. The reason is simple. These search queries lead to high conversions. People are searching for them because they are looking for products to purchase. They will spend money and purchase the product if they are interested. On the other hand, a person searching for ‘funny pets’ is obviously not going to purchase anything from the resulting website. They are probably not even going to click any ads that show up. 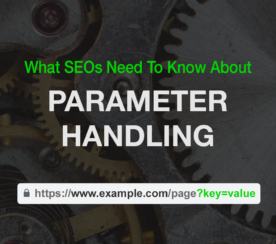 When there are perks, search engine optimizers work really hard in order to gather as many links as possible with synonyms included. This is the reason why Google returns almost the same kind of results even if we use synonyms in search queries for competitive niches. What we understand is Google is not perfect. It can be played with nicely. 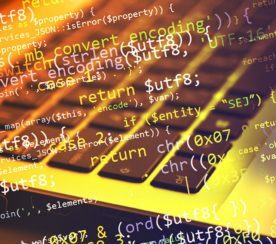 It has some level of basic ability to come up with proper search results for searches involving synonyms, but that doesn’t make the search engine perfect. If the niche is highly competitive, you will get to see ad-like results from companies on the top. 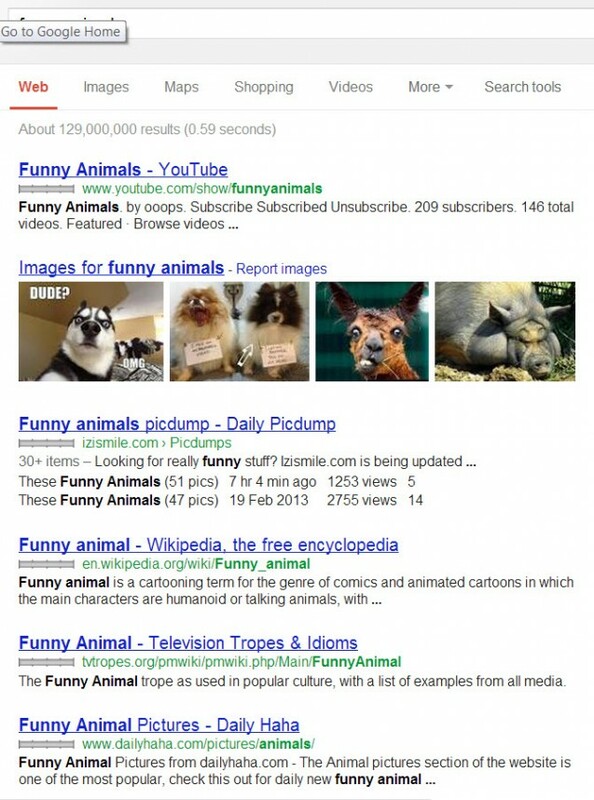 On the other hand, if the search query is not competitive, you will most likely see very relevant results from people who are actually interested in the topic—just like the people who run myfunnypets.net. You will find some information about how other search engines handle search queries and synonyms in Lenin’s article about the best search engine.